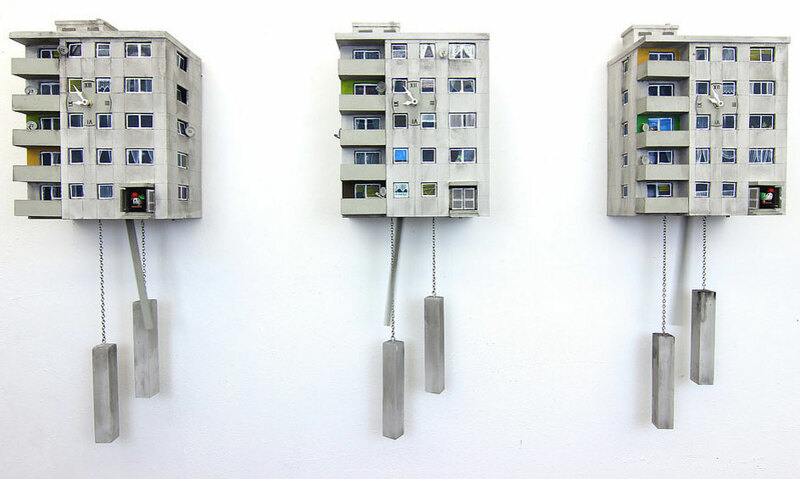 "Cuckoo Blocks" are Zimmermann’s answer to the traditional cuckoo clocks from the Black Forest in Germany. They present a contemporary view of urban living and compelling architecture. The hull is new, but the soul, a clockwork with a cuckoo, is still an old one. Two aspects have a special significance here: buildings with a striking history and architectural value, as well as living in social flashpoints. Both are connected to the blocky, massive concrete construction. The classic cuckoo clock is a symbol for prosperity in the middle class and is considered a kind of luxury for the home. The updated version, a prefabricated panel construction (“Plattenbau”), reveals today's urban and social life in residential blocks. The second aspect of "Cuckoo Blocks" is no less interesting. 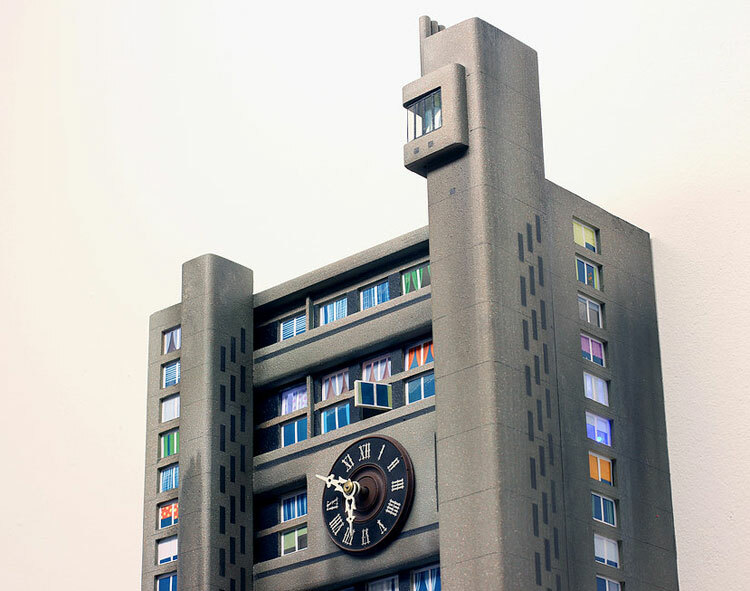 For example, the "Glenkerry House" by Ernő Goldfinger, built in the striking style of brutalism, was once accommodation for average citizens. Today it offers "hip" and hardly affordable living in London. The hotel "La Flaine" by Bauhaus architect Marcel Breuer, is a beautiful architectural example, but is an eyesore as this huge hotel complex is located in the middle of the French Alps. The cuckoo clock series has been extended by Zimmermann with birdhouses for native songbirds. 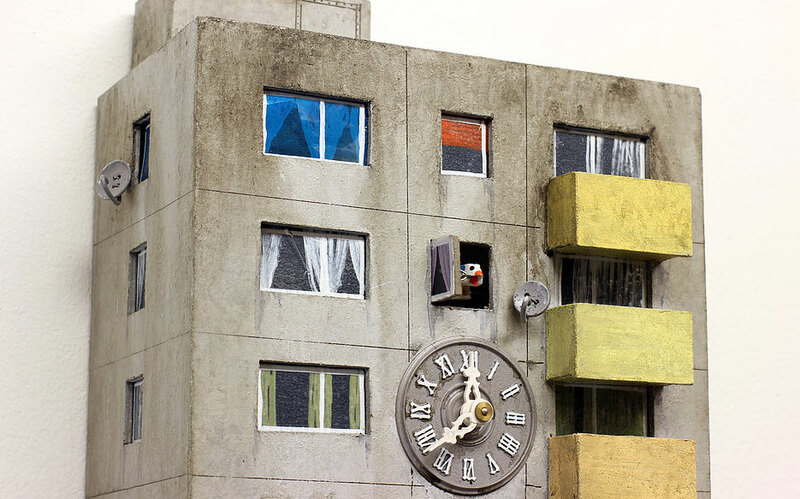 The prototype, a model of a social housing building from Catania/Sicily, was quickly inhabited by a pair of titmice. The three nondescript birdhouses next door remained uninhabited. Perhaps it was the small satellite dishes which convinced the birds of the “social bird housing”. Check out all the amazing designs of Cuckoo Blocks on Guido Zimmermann´s website.